For starters, the Barnstable girls won the South sectional title and celebrated above. The next week, it was the state championship. The captain led Andover to the state title and took first in every event in which he competed this season, including all six events at the state meet, which he won easily. He set the state vault record (9.8) and will attend Penn State. Stewart was untouchable this year, winning both the Coaches Invitational Championship (37.65) and state all-around (8.125) titles. She led Nauset to a third-place finish at their first state meet, where she nailed her bar routine for an impressive score of 9.8. The freshman placed second behind teammate Brian Manning in the state all-around competition with a 41.0 and his team won the state title. He took second in the pommel horse (7.0) and high bar (6.3) and third in the still rings (5.55) at the state meet. The senior placed third in the all-around at the MIAA state meet with a score of 40.5, helping Burlington to a third-place team finish, one year after winning the team title. He also took second in the floor exercise (8.6) and parallel bars (7.5). The sophomore led Attleboro to a fourth-place finish at the state meet. He finished sixth in the all-around with a 34.8 and fourth in the high bar with a 7.1. He also plays varsity football and is an honor roll student. The sophomore placed fifth in the state all-around competition with a 37.5. A honor roll student, he also placed fourth in the parallel bars (7.1) and tied for sixth in the high bar (5.6) to help Andover achieve its first state title since 1970. The senior led Lowell to a second-place finish at the state meet with his fourth-place finish in the all-around (38.2). He also finished second in the still rings with a 5.6. He plans to attend UMass-Lowell in the fall. The senior captain finished fifth in the vault (8.0) and seventh in the all-around competition at the MIAA state meet with a score of 33.0. He also runs track and cross country and is a member of the National Honor Society. In the all-around, the sophomore placed third at the MIAA state meet and eighth at the Coaches Individual Championships. Her high score this season was a 37.5 and she also holds the school record for the floor exercise with a 9.7. The junior scored a 37.6 in the all-around competition at two big meets this season, good enough for second place at the Coaches Individual Championship and third at the North Sectional Meet. She also plays volleyball and runs track for Melrose. The Cranberry League All-Star took fifth in the all-around at both the state and South Sectional meets. At the New England Championship she won the balance beam (9.575) and took second in the all-around (37.325) to help Barnstable complete its undefeated season. A repeat All-Scholastic, the Northeast Conference All-Star finished first at the North Sectional meet with a 38.1, the highest all-around score of her career. She also placed third at the Coaches Individual Championships (37.375) and fourth at the MIAA state meet (37.075). Voted Senior Gymnast of the Year by the State Gymnastics Coaches Association, Kaplan led Sharon to Hockomock League title and second place at states. She finished first in the all-around at the South Sectionals (37.9) and second at the state meet (37.725). The senior’s stellar floor performance (9.625) and third place all-around score (37.425) at the South Sectional meet helped Nauset qualify for states for the first time in program history. She finished eighth at the state meet with an all-around score of 36.625. The Bay State Conference Senior of the Year led Wellesley to its fourth straight league title. At South Sectionals, the honor roll student placed first in the vault (9.725) and bars (9.6) and second in the all-around with a personal best of 37.875. The freshman won the balance beam at the Coaches Individual Championship with a score of 9.6 and placed seventh in the all-around competition (37.05). She is also a talented diver for Walpole, finishing second at this fall’s state swim meet. The NEC/CAL MVP set a personal best score of 37.75 in the all-around. She placed fourth at the North Sectional meet where she finished tied for third on the bars (9.35). Shernan also finished seventh at the Coaches Individual Championship. 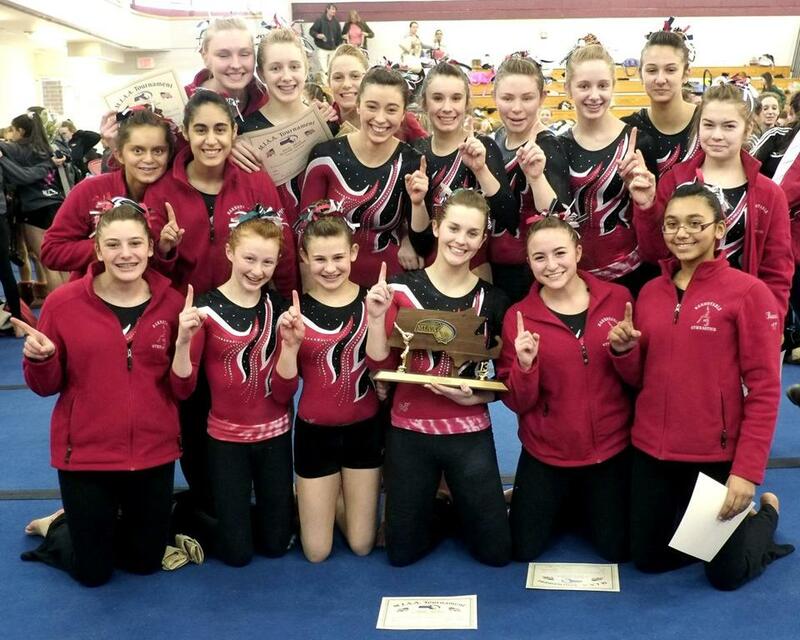 Stevens led North Andover to its first ever North Sectional title, where she placed second in the all-around (37.975). The team MVP also broke school records in the all-around (38.3), floor (9.8) and beam (9.7) and tied the school record on vault (9.55). The Cranberry League All-Star helped lead Barnstable to the MIAA state title with her seventh-place finish in the all-around competition (36.75). At the South Sectionals she placed second in the floor (9.65) and tied for fourth in the vault (9.3). Wang led Newton South to its first trip to the state meet in program history where she placed 10th in the all-around (36.1). At South Sectionals, the freshman finished tied for third on the beam (9.55) and fifth overall (37.025). The 32-year veteran coach was just a freshman at Andover High the last time the Golden Warriors won the state title. Sirois coached his small group of dedicated athletes to a decisive win at states, finishing with 164.55 points. Chase led a young squad to a Cranberry League title and first place finishes at the South sectional, state and New England meets. The state championship was his ninth in 14 years as head coach. The Red Raiders finished the season undefeated (15-0). Bay State — Braintree: Brooke Ellis, Erin Shea. Framingham: Maura Sticco-Ivins. Natick: Glaire Gerdes, Danny McElhinney. Needham: Kristen Folan, Marykate Hegarty, Maggie Nieto, Maria Smirnov. Newton North: Amara Lutwack, Julia Wang. Norwood: Kristen Folan. Walpole: Olivia O’Hara, Hannah Phelan. Wellesley: Molly Harrington, Alli Kelliher, Olivia Novins, Christa Perry. Cape Ann/Northeastern — Beverly: Heather Gomes, Hannah Rennie. Danvers: Roni Levine, Emily McPherson, Jackie Veatch. Masconomet: Jess DeMarco, Mina Shernan. Winthrop: Christa Vaccaro. Cranberry — Attleboro: Meredith Moreau. Barnstable: Jillian Fraser, Tali Twomey. Nauset: Kasey Kilmurray, Kim Stewart. Dual County — Newton South: Camila Hernandez, Sally Jenks, Kalena Wang. Westford: Jackie Beals, Ashley Craig. Hockomock — Canton: Stephanie Milne. King Philip: Katie Paul. Mansfield: Alexa Anastos, Stephanie Crowley, Danielle Dousa, Maddie Krysko, Kate Moore, Shannon Moore. North Attleborough: Carly Ebzery. Sharon: Jessica Chabot, Alicia Dagle, Samantha Kaplan. Merrimack Valley — Andover: Courtney Carver, Jessie Livingston. Billerica: Gina Pomponi. Central Catholic: Kayleigh Dugan. Chelmsford: Eleanor Almeida, Nikki Santhanakrishnan. Lowell: Katheryn Manning, Mariam Traore. Methuen: Cam Cyr, Ashley Horan, Cyanna Roig, Zach Smith. North Andover: Julia Montecalvo, Madeline Shea, Nicole Stevens. Middlesex (Freedom) — Burlington: Alexandra Avendano, Amelia Cecere. Melrose: Annalisa DeBari. Stoneham: Gianna Lanzillo, Sarah Muolo. Middlesex (Liberty) — Arlington: Chase Currier, Ruthie Ferrante. Winchester: Bella Capachietti, Megan Miranda. Woburn: Kelly Doherty.